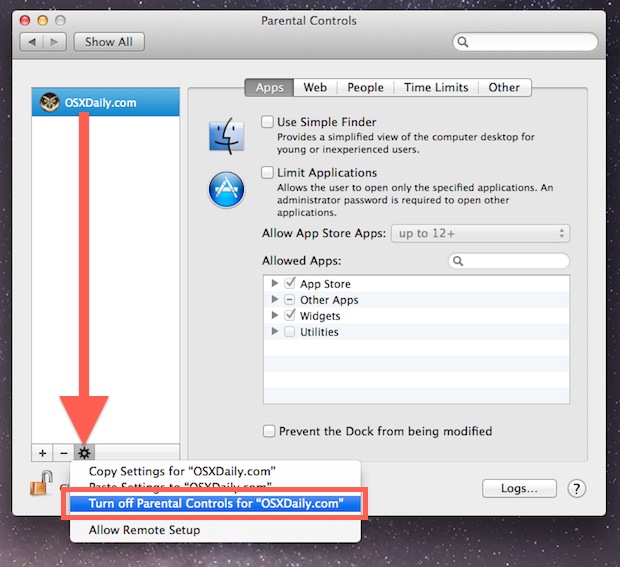 Parental Controls are a great feature of Mac OS X that allows for restrictions to be placed on a specific user account on a Mac. These restrictions are varied and chosen by whoever set the parental control feature, ranging from setting time limits for computer use, to preventing certain web pages from being accessed, to even restricting app usage as deemed necessary. While it’s a handy feature, there are times when you may want to disable Parental Controls after they’ve been set, either for administrative purposes or because the set restrictions are no longer necessary. 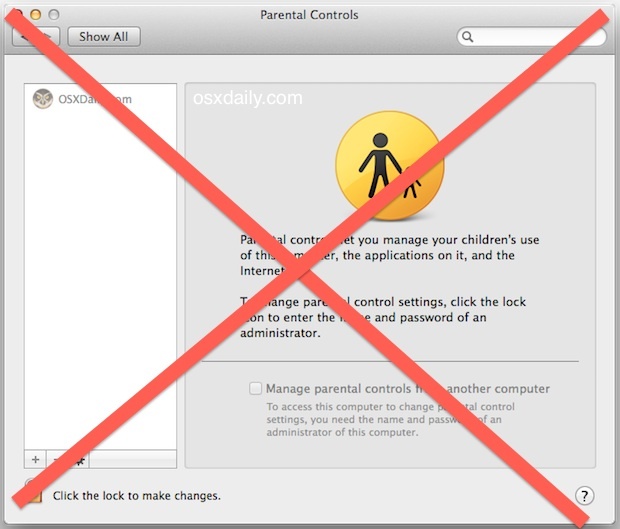 Disabling Parental Controls on an Mac OS X account is easy and it can be done either directly from the account they are actively set on, or with another Mac login that has administrative access. If you’re disabling the account restrictions from the account that currently has them enabled, you will need to enter an administrator login username and password – that is an obvious security precaution to prevent someone from disabling the restrictions without proper access. This instantly disables all parental controls and restrictions that were set for that Mac login, so there’s no need to manually tweak settings for individual restriction options. At this point the Mac account will have whatever default access it was set to beforehand, whether that’s a full guest user account, normal login, or administrative user. Yes, but what happens when you want to turn the restrictions back on following an administrative task? I’ll tell you-from personal experience-the restrictions you’ve spent a significant amount of time setting up on the account are wiped! You have to start from scratch! I suffered with my first Microsoft moments using OSX! When are Apple going to make this easier? I gave up using Parental Controls because I found them to be extremely buggy. As far as Apple software is concerned, parental controls have been my worst experience. Certainly they appear to be the “red-headed step-child” of the OS and completely ignored for updates or improvements. I couldn’t agree more with the other comments… The parental controls are need of some engineering time and focus group time. Apple spends a lot of time on the UI – how about giving parents a fighting chance? I enabled parental controls for time limits but for everything else – like internet usage and age appropriateness of websites – I enlisted the help of an internet filter up stream that couldn’t be bypassed. Yes, I had to put my big boy pants on and be a heavy handed dad occasionally but again these aren’t meant to take the place of a parent’s guidance just assist. Your 15 month old figured out how to create a new user account name and password? Wow, enroll them at MIT now! Scholarship incoming!! Hi, I am a very dummy user and I just set the parental control and created another account on my macbook air. It restarted. And it is on with the log in page just without the blank space where to type your password. The screen has 2 account icon that I did create, but I cannot click either of them. There are icons for sleep, restart, and shut down, but none of them can be clicked. In fact, none of the screen part is responsive. What should I do? All of my teaching material is there. I’ve mislaid my password. How can I retrieve it? several programs, Printmaster ( a publishing program), especially. Adding to the last entry: there is only one account on this MacBook Pro – mine. It is the admin. How do I disable it? J don’t use mail but respond directly as now, But How can I firmly and completely destabilize parental controls?